First, an apology. Multiple apologies. I realize the comic has been consistently a day or so late recently. This week I had hoped that by skipping Monday’s comic I could catch up, but it was an exceptionally rough week health and stress wise. Beyond that, I’ve just been having major problems working on the comic lately, which saddens me because I love it so much. So this update is taking longer than normal because I decided to scrap some of what I already had and try out a subtle difference in the way I draw. Don’t worry, it’s not going to be a huge change (not like that time with the sudden shading). But it lets me have more fun, brings The Fourth more into line with the way my art outside of its pages has been evolving, and refreshes my love for drawing the pages themselves. This slightly rougher feel is what I’ve been using for almost all of my non-comic drawings for months, and I’ve really fallen in love with it. I also feel it works better with the textures I usually employ in the backgrounds (and sometimes even on characters) and will help make the pages a more cohesive whole. But of course, if you all hate it, or I don’t like it so much after all, I can always just say it was a special 300th comic thing. I deeply regret having to miss this day too. I really didn’t mean for this week to turn into a hiatus, and I’d love to try to pump this comic out, but a raging headache says otherwise. I wanted to at least provide you with the above picture today, which was done as a request by one of our readers as part of an “OC Art Challenge” on tumblr. 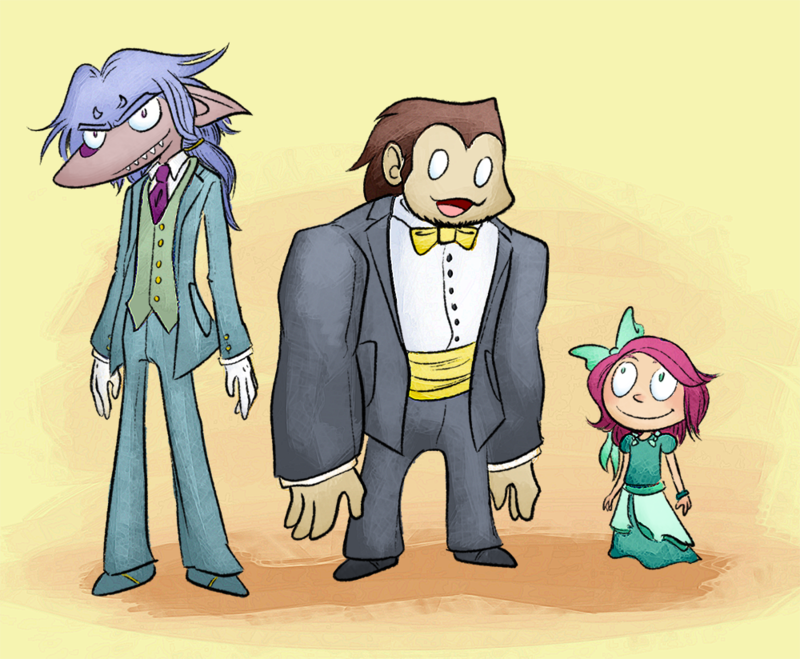 Nicole/Ecadia requested the main trio dressed for a formal dinner! Whenever the next challenge comes out, whatever it is, I’ll be sure to solicit you guys in the comments too for requests. Don’t forget to follow the Idenau tumblr to see this kind of stuff as I finish it. Finally, I just added a couple of wonderful new pictures to the fan art page. They are really fantastic, but you’re going to have to go over there yourself to see them (just in case you’ve never been)! Have a great weekend, friends. I’ll see you on Monday. Pinky promise, cross my heart. I like it. The more subtle lines make the characters feel less separate from the background. The way I worded that sounds like they’re less noticeable or something… I just mean they feel more cohesive with their world. I understand! That’s one of the big things I was going for, so I hope it works out. I want them to seem less like cartoon characters that I just kinda pasted in there over a background. I really like that style there. I think it will fit great in the comic. It is ok if you need to take a break, just try not to get into a habit… Those can be hard to break. Then again, you also don’t fall off the edge of the world like other comics artists do. That new style might look nice. I think we will only know when you do it, though. Nah. It bothers me enough when the comic is late due to my tremendous guilt complex, and how much I hate to let other people down, even if it’s something as relatively simple as a webcomic update. I actually had a nightmare last night where I was unprepared for a play and ruined everything and it was horrible. I woke up with my heart racing for a good hour afterward, confused if it had been real or not. Plus I normally love drawing the comic anyway, but it just hasn’t been as fun lately. It’s felt wrong because it’s been at odds with the other art I do. I think switching it up like this will bring the enjoyment back. Ah, I didn’t know that it bothered you that much. Skarva looks like he should be debating over cases. I never noticed how large Derk’s arms were in comparison to his legs. Taking “top heavy” to a whole new level. I like the new lineart! I feel like it has a more “storybook” feel. Maybe it’s just me. I love it! The textures definitely help the whole thing work. I have no idea what that means though. …Daaaaang, Skarvs looks GOOD for a mutant sharkman. Also, I like the lineart!